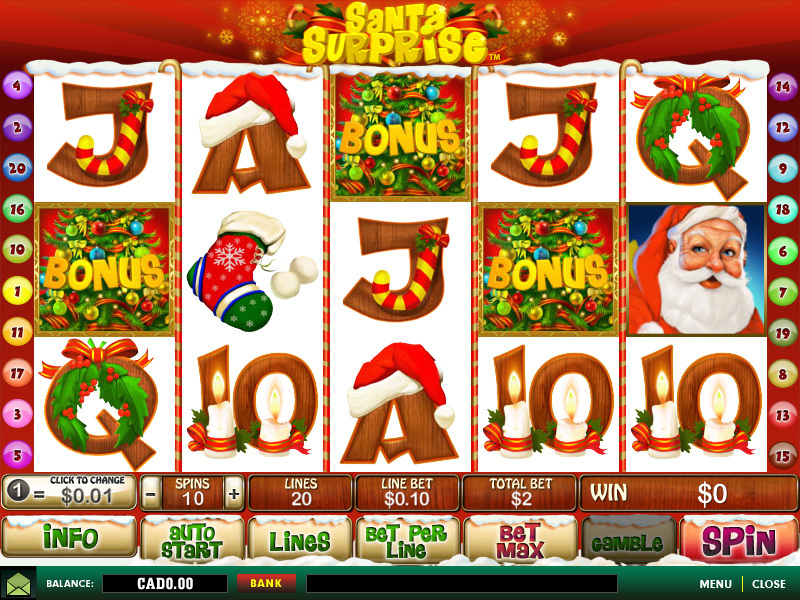 Santa Surprise is a new Playtech slot that surprised me when I logged in to Casino.com today. I had recently looked for Christmas themed slots, since it’s that time of year, and couldn’t find any to play at Playtech casinos. 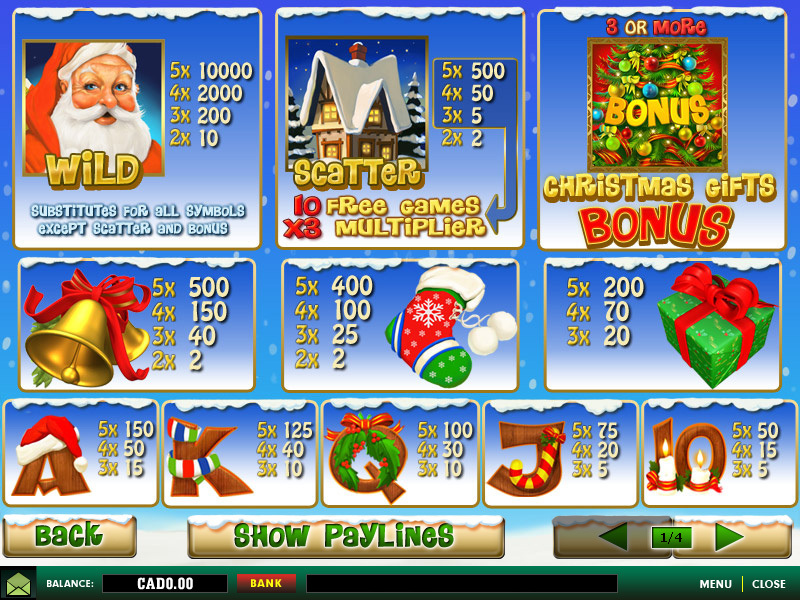 This festive slot features 20 paylines, a wild symbol, free spins, and the Christmas Gifts Bonus, a second screen bonus feature. 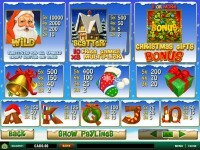 The Christmas Gifts Bonus is triggered when three or more bonus symbols line up left-to-right on an active payline. You are taken to a screen where you pick 3, 4, or 5 gifts depending on the amount of bonus symbols that lined up to trigger the feature. It seemed like there were plenty of those symbols on the reels because it triggered quite often. Free Spins are triggered when three or more scatter symbols land on the reels during a spin. You are given 10 free spins with all wins being tripled. 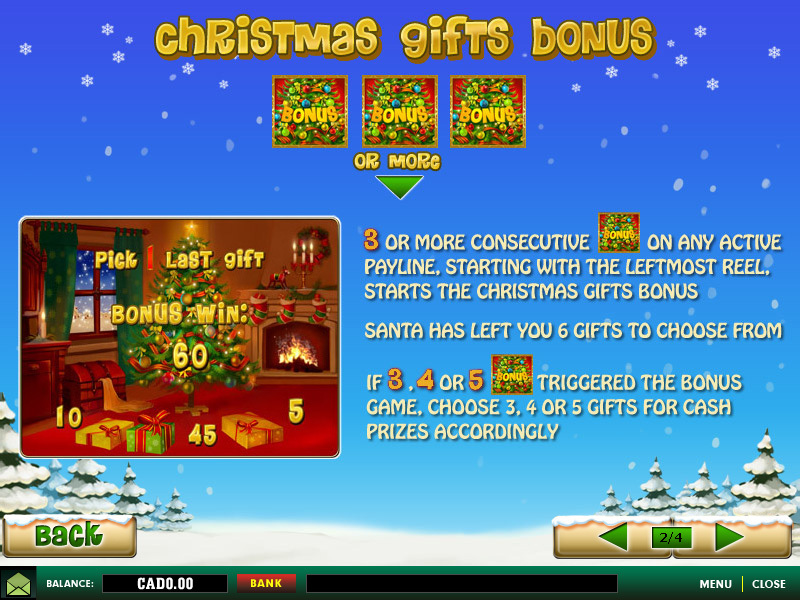 The Christmas Gifts Bonus can be triggered during free spins, and free spins can also be retriggered. I actually didn’t do too bad playing this slot today, and I don’t normally have the best of luck playing Playtech slots. It seems most of their slots are fairly high variance because when I have been able to win, they have been great wins. See the screenshots below for paytable information, and hopefully some shots of my personal wins in the future. 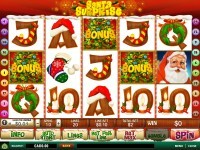 Play Santa Surprise today at any of these trusted Playtech Casinos.